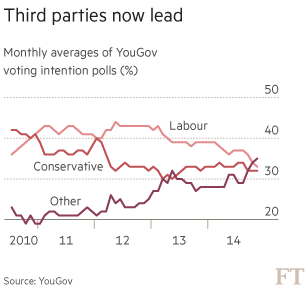 People in the UK are more likely to support a third party rather than vote Conservative or Labour in the general election next May, say pollsters YouGov. In short, two-party politics is dead. Unfortunately, we have a democratic system based on the assumption it isn’t. That’s not a good or healthy combination.